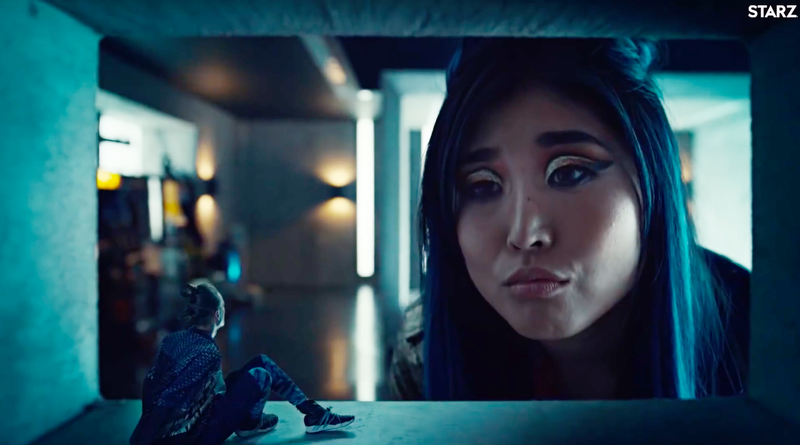 Kahyun Kim as the god of New Media gazing down on the Technical Boy (Bruce Langley) in American Gods’ second season. Some of the most fascinating things about Starz’s adaptation of American Gods revolve around the major changes made in order to make the show feel contemporary. Neil Gaiman first penned the original novel back in 1999 when the world was a drastically different place—and heading into season two, the show is still coming up with unique ways to stay relevant. When I spoke with Gaiman at New York Comic Con this year, he brought up the Technical Boy—a god of modern technology—as the perfect example of a character who would read as supremely dated by today’s standards. Rather than being a stereotypical, basement-dwelling nerd with a fondness for dial-up modems, Starz’s take on the new god is instead a supremely-skilled vape fanatic whose visual aesthetics constantly change as a reflection of the speed at which modern technology is iterated upon. “The biggest thing that simply didn’t exist in the book was social media. That was why we knew we needed a New Media. You know people go “Oh, the New Media, so you’ve replaced Media?” And it’s like “No, no Media...she’s somewhere still out there wandering around. She just has less and less people watching her, less belief and power. New Media is New Media. “One of the things that we didn’t have when I wrote the book was that we were not observed. Now there are cameras on us most of the time. I remember discovering how much we’re observed once when my backpack went missing in a hotel and I wound up being led into the security bowels.